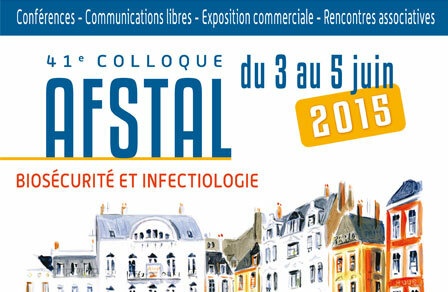 Noroit will participate in the AFSTAL (Association Française des Sciences et Techniques de l’Animal de Laboratoire) conférence, in Nantes, from 12th to 14th october 2016. During this congress “Microbiota and Animal Models” will be processed. The opportunity to discover our range of animal science equipment: isolator for laboratory animal research I-Box zoo, vented animal cabinet A-Box, changing station Esolis, class II safety cabinet Solis, class II safety cabinet for binocular and microscope Bin-Box. Noroit will participate in the AFC (Association Française de Cytométrie) congress, stand n°25, from 8th to 10 th november 2016, in Montpellier. The opportunity to discover or to know more about our H-Box cyto, a type II Safety Cabinet dedicated to cytometry issues. Noroit participated in the AFC (Association Française de Cytometrie) congress, stand n° 9, from 18th to 20th november 2015, in Juan Les Pins, Palais des congrès. The opportunity to discover or to know more about our H-BOX Cyto, a type II Safety Cabinet dedicated to cytometry issues. Noroit competed for Forum Labo’s Innovation Trophies, with Esolis, a change station for rodents, recently launched on the market. This last model of the laminar air flow range features a patented system to simplify the prefilters replacement, whilst ensuring entire user protection. A good example of how R&D and innovation can improve safety and users comfort! Noroit participated in the 2014 MifoBio thematic courses, in Seignosse, and made freely available to participants 2 “Solis” Class II Safety Cabinets. The focus of these thematic courses is microscopy applied to biology: conferences, roundtable discussions, and workshops.